EBI is honored to be part of history in the making as progress continues on the Vogtle 3&4 Project! A big shout out to our team onsite who continues to do Whatever it Takes to ensure our scope of the project is completed safely and successfully. 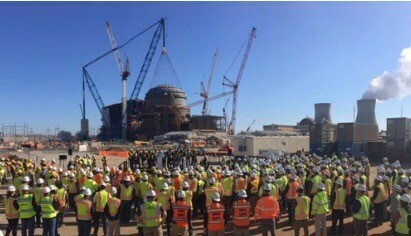 Today was a significant day for the Vogtle 3&4 project. With U.S. Energy Secretary Rick Perry and others on site, we set the top of the Unit 3 containment dome and announced the closing of approximately $1.67 billion in additional Department of Energy (DOE) loan guarantees for the new units. With the placement of the dome, the project is now 75 percent complete. The next few months will be just as exciting. By closing up containment, we’re able to work inside without the effects of weather. A significant number of systems on Unit 3 will be finished, tested and turned over in 2019, and we’re beginning to see the finish line for construction. In fact, the transformation of the project and the site itself in the last year has been remarkable. We’ve achieved a weekly earned hours rate that many thought wasn’t achievable, and the team is functioning well and learning how to maintain this higher level of execution. The site has clearly taken our Strategy for Excellence to heart. The team has developed its skills, is modeling high standards and getting better every day – all while building the plant and the future of nuclear power in America. I want to congratulate them on their success today, as well as all the hard work that has brought us to this point. We are in the midst of the largest production year in the history of the project, and because of this team, I’m very confident about bringing these units online and integrating them into the fleet. As always, I appreciate the daily work of our Southern Nuclear employees both at Vogtle 3&4 and across the fleet to achieve and sustain excellence.